57 of the world’s 100 largest oil and gas firms are using, or have plans to use predictive analytics. How will predictive analytics transform oil and gas? 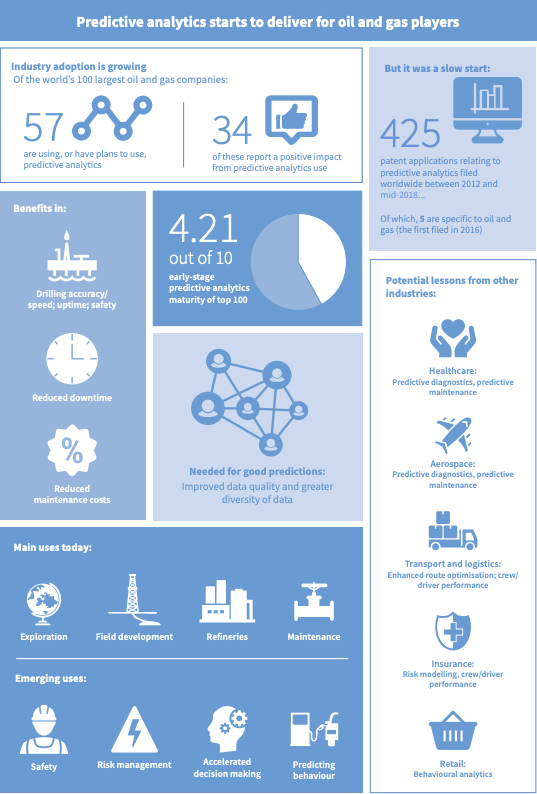 A new industry report produced by Lloyd’s Register (LR) – reveals the pace, development and adoption of predictive analytics in the oil and gas sector. The report brings in to focus how different companies are using predictive analytics and to what extent companies are transforming their own technology and data capabilities to predict a better performing and sustainable future between operators, service providers and technology makers. 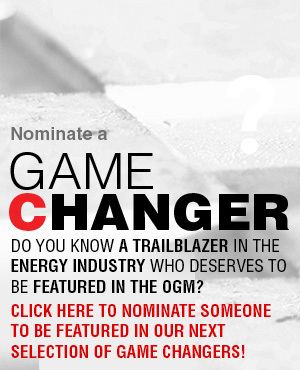 • 57 of the world’s 100 largest oil and gas firms are using, or have plans to use predictive analytics. Proving return on investment (ROI) to management may take time, but is feasible Companies using predictive analytics in unconventional wells have often been able to tie its use to demonstrable gains in improved drilling accuracy, efficiency or cost savings. Doing the same for predictive use in maintenance and safety is less straightforward when avoidance of incidents or downtime are the main benefits. Efficiencies from these can be quantified, however, and 2–3 more years of running and validating algorithms and accumulating databased evidence should help many firms to demonstrate returns they have difficulty proving today. 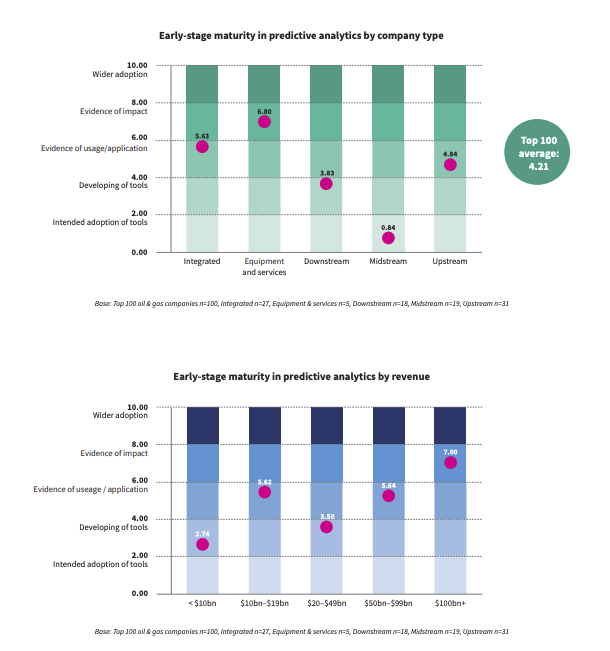 Predictive analytics is delivering benefits today Based on publicly available evidence, 57 of the world’s 100 largest oil and gas firms are using, or have plans to use, predictive analytics. Over half of these companies (34) report that their use of such tools has had a positive impact of varying degrees. Within the top 100, evidence of predictive adoption and use is most extensive upstream, in oil-field equipment and services, exploration and production. It is the largest firms in terms of revenue and market capitalisation (mainly integrated oil and gas companies) that appear to have advanced furthest with the technology. Fields of application are widening beyond reservoir performance Several large oil and gas companies have put predictive analytics to good use upstream, earning returns from improved performance of unconventional wells. Maintenance, safety and production control are newer areas of adoption. Companies are exploring future uses of predictive tools in combination with emerging technology capabilities such as machine vision4 and behavioural analytics. Use cases in other industries may hold potential in oil and gas Industry firms are scanning the health, aerospace, financial services and other industries for examples of predictive analytics use in equipment diagnostics, prognostics and maintenance, pricing and risk management. Other relevant use cases include machine vision in the automotive, sport and healthcare industries; behavioural models in the retail and financial services industries; and enhanced route optimisation used by transport and logistics firms. Data quality issues hamper predictive analytics use, but these can be surmounted Data quality and availability are viewed as the chief impediments to the use of predictive analytics in the industry. 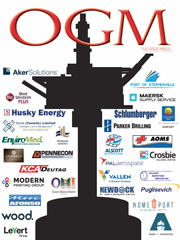 Oil and gas companies collect masses of data, but often can only access a small portion of it. Standardising disparate sources of data can also be difficult. Experts say, however, that data quality need not be perfect, and that workarounds are possible. Using advanced data science, for example, companies can filter data to overcome quality problems. New data sources are gradually becoming available Accessing the external data and expertise needed to make predictive analytics work requires oil and gas firms to widen the scope of their interaction. For example, the world’s technology giants support open platforms for developing algorithms, as well as data lakes and cloud platforms that provide great analytics power. Some executives interviewed for this study say their firms are benefiting from access to data and expertise on such platforms. – designing the ‘rig of the future’. • Respondents believe Artificial Intelligence (AI) is unlikely to be applied beyond niche applications for another three (3) years. The research sought the insights and opinions of leaders across the sector, such as: Eric Abecassis, CIO, Schlumberger, Stephen Ashley Manager, Digital Transformation Solution Centre, Oil & Gas Technology Centre, Willem van Asperen Director, applied artificial intelligence, PA Consulting Group, Richard Barclay Manager, Advanced analytics, ConocoPhillips, Margery Connor Leader, Data science capability and Technology, Chevron, Daniel Jeavons General manager – data science, Shell, Michael Jones Senior director of strategy and M&A, Halliburton Digital Solutions, Adam Judelson Founder and CEO, Cognotient, Neil Kavanagh Chief science & technology manager, Woodside Petroleum, Narayan Laksham Founder and CEO, 4casting Systems, Joel Meltzner CEO and president, i4 Insight, and Morten Møller Pedersen Deputy asset manager, Maersk Drilling. By using large volumes of historic seismic and production data, existing and new sensors, and powerful algorithms, companies have unlocked insights not previously available to them, which has boosted efficiency and productivity, reduced downtime, and earned them demonstrable returns along the way. Unconventional wells, mainly in North America, have been the biggest early beneficiaries of predictive analytics to date. “Along with our clients and partners, we believe that the use of predictive analytics can lead to both improved performance and enhanced safety and better risk management. Encouragingly, the findings of this special edition of the LR Technology Radar show that this potential is beginning to convert into reality. The report highlights how the experience of predictive analytics used in consumer markets can provide better insights into how more accurate predictions are generated when multiple sets of data from different sources are layered up. The 2018 Technology Radar Oil & Gas report is published as of November 12, 2018. Started out in 1760 as a marine classification society. Today, one of the world’s leading providers of professional services for engineering and technology – improving safety and increasing the performance of critical infrastructures for clients in over 75 countries worldwide. The profits generated fund the Lloyd’s Register Foundation, a charity which supports science and engineering-related research, education and public engagement around everything they do. All of this helps us stand by the purpose that drives their purpose of Working together for a safer world. In a world of increasing complexity – overloaded with data and opinion – we know that our clients need more than technology to succeed. They need an experienced hand. A partner to listen, cut through the noise and focus on what really matters to them and their customers. Our engineers and technical experts are dedicated to assurance. That means a commitment to embracing new technology, and a deep-rooted desire to drive better performance. So we consider our customers’ needs with diligence and empathy, then use our expertise and over 250 years’ experience to deliver the smart solution for everyone. Global research, sector insights and in-country reports and industry surveys form part of the Technology Radar series managed by the energy business of LR. The reports combine LR’s expert knowledge with third-party insights, to provide data-driven findings on the role of innovation, technology, safety and sustainability in the current and future energy industry. 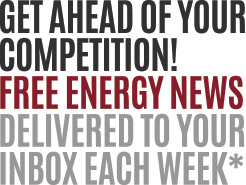 Our role at LR is to ensure that we provide that independent viewpoint help government, energy producers, manufacturers, regulators and policymakers to the energy industry extract energy safely, and to deliver energy sustainably, with minimal risk to people and to the environment, and in socially responsible ways. We recognise that true value can be created by nurturing stakeholder relationships, based on trust and understanding. LR is addressing the industry’s most significant technology and sustainability challenges by interacting and working with energy stakeholders on an ongoing basis. Through interviews with senior industry practitioners and surveys of energy professionals, the Technology Radar series provides a compelling insight into the latest industry thinking, trends and insights.